As part of its court settlement with the California Air Resources Board (CARB) and the U.S. Environmental Protection Agency (EPA) for the DieselGate scandal, Volkswagen agreed to invest $2 billion in electric vehicle infrastructure in the US. Last month, we reported on their plan for California, which includes installing ultra-fast 320 kW chargers, where they need to spend a significant part of the settlement. But the rest of the US is not going to be left empty-handed. 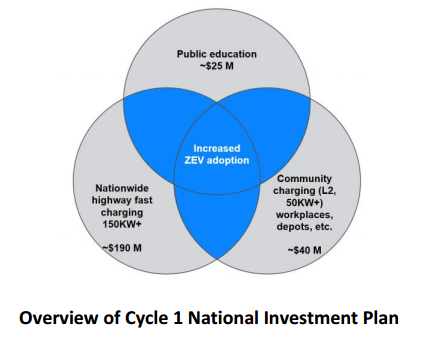 VW and the EPA released the national plan and it includes a “nationwide 150 kW+ fast-charging network” along highways, which is by far the most exciting part of the plan for EV drivers. As previously reported, VW set up a new subsidiary called Electrify America to build the network independently from the company. The chargers will not be proprietary to VW and use Combined Charging System (CCS), CHAdeMO and open protocols like Open Charge Point Protocol (OCPP). There are also chargers that the company calls “community charging”, which consist of level 2 chargers and lower-speed (50 kW+) DC fast-chargers. They are allocating ~$40 million under the current round with this proposal. EV enthusiasts should be happy to know that VW is at least aiming to spend most of their money on high-speed chargers, which could charge most EVs in less than an hour. It’s not the most powerful charging technology, but it’s in the higher end of the spectrum. ChargePoint recently announced a 400 kW charging technology. Additionally, 5 major automakers announced that they joined forces to deploy 400 ultra-fast (350 kW) charging stations for electric vehicles in Europe. Those stations should start being installed in the coming months. And Tesla is also expected to soon release the “version 3” of its Superchargers. Elon Musk hinted that it will put 350 kW to shame, but there’s no clear timeline at this point for the release of the technology. If the plan is quickly approved and they stick to the schedule, it will likely have a wide impact on electric vehicle drivers across the country and potentially spur EV adoption.